See those experts gracefully curving down the slopes? They are parallel skiing. Here at The Adventure Junkies, we will take you through the steps to grow from a wedge skier to a parallel skier. Our beginner’s guide describes how to parallel ski using 11 simple steps. Instead of snowplowing or skiing in a wedge to control the skis, the parallel skiers use the ski’s edges. When edges get into the action, the speed picks up and the thrill begins. That’s when the skis actually start doing the work they were designed to do. Once you convert to parallel skiing, your mountain playground will become larger. With parallel turns, you’ll be able to bump up to blue or intermediate runs. You’ll also be able to ski steeper runs. Most beginner skiers master the snowplow or wedge turn on a beginner slope. Shifting into parallel turns does not require going to steeper or onto terrain that adds nuances of difficulty. As a matter of fact, learning a new skill on easy terrain is always a smarter approach. You may have already started during your first lessons by finishing your wedge turns with your skis parallel with each other. Remember those pizza and French fries positions? The pizza or wedge can move naturally into the French fry or parallel position. 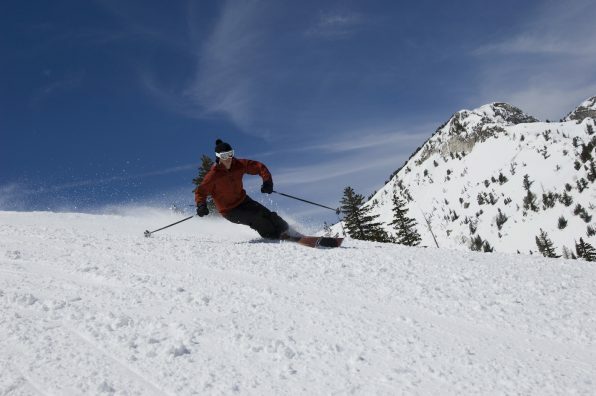 To convert a wedge to parallel skiing, start by focusing on finishing the turn. As you ski the wedge into the fall line, let your skis slide into the French fry or parallel position around the finish. Ride them parallel across the slope, sliding only into a wedge when you need to slow down or start the next turn. As you get more comfortable with the speed, parallel skiing happens more naturally because of the momentum. Turning parallel on skis is the same as turning in a wedge, only easier. The acts of pressuring the working ski and relaxing the resting ski are identical. You can prepare to learn to parallel by getting in shape for the ski season. 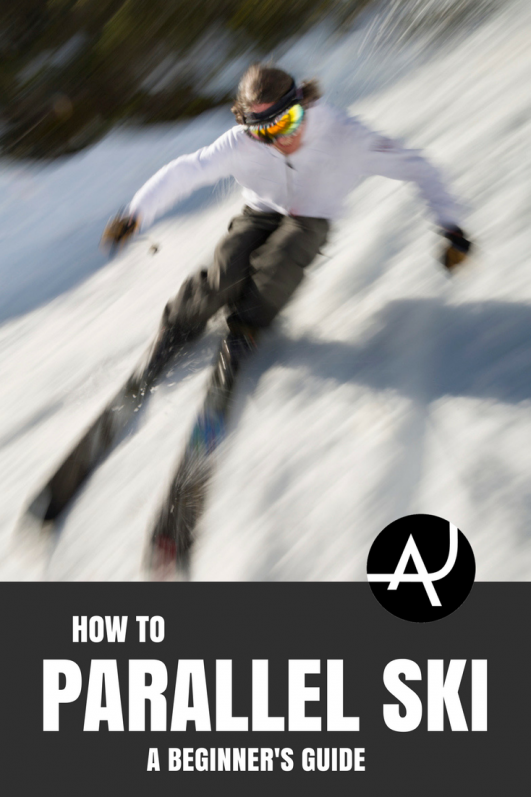 Before going further with more steps, familiarize yourself with these terms to help you understand how to parallel ski. This ski is always in charge. It’s the boss. Some instructors will describe it as the outside or downhill ski, depending on the location in the turn. This ski is the assistant. Some instructors describe the resting ski as the inside or uphill ski, depending on where you are in the turn. The working ski is always focused, pressured and tilted on big toe edge of the ski. The resting ski uses the little toe edge of the ski. Between turns, the old working ski becomes the new resting ski and vice versa. 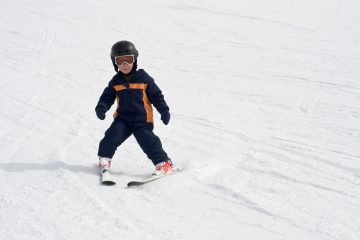 Some instructors talk about moving to hips, knees or other body parts to execute parallel turns. For many learners, splitting focus between so many body parts creates confusion. The easiest way to learn to parallel requires focusing only on the body parts inside your boots, namely, the shins, ankles, big and little toes. Your boots are the steering wheels for skiing. Your focus needs to be on flexing the ankles, not the bending knees. When bending their knees, some people automatically stick their bums out. This puts weight on the heels instead of the balls of the feet. Flexing the ankles instead results in slightly bent and relaxed knees which does not cause the bum to move. Keep your focus in your boots to help you learn to parallel quicker. For parallel skiing, your shins and boots should be friends. On the working ski, the shin bone should connect to the boot tongue. To be more precise, the side of the shin should press into the boot. The amount of pressure will vary based on your location in the turn. To find the location where your shin and boot tongue should meet, examine your bare shin at home. Run your hand down the front of your shin, and you’ll feel hard bone. Move to the inside area of your shin and feel straight up from your inside ankle bone, where the leg is fleshier. To find the prime shin spot for parallel skiing, move half way in between the line up from the ankle bone and shin. On that slight inside surface from the shin, press about 4-5 inches above your ankle. That sweet spot may be slightly tender, but it’s right where your shin and boot should meet. During the parallel turn, you will vary the pressure on your working sweet spot. The turn will start with a little pressure, go up to medium pressure in the fall line and finish with heavier pressure. The amount of pressure correlates to the amount of control you desire. Beginner skiers sometimes complain that their shins hurt. If yours hurt, that means you are pressuring the front of your boot correctly. Pushing the sweet spot of the shin forward into the boots directs the boots and the skis where you want to go. The shin pain abates soon, making pressing the shins on the boots becomes easy. To learn to parallel, focus on shrinking the wedge or snowplow. When launching into the turn, aim to make the wedge into a smaller “V” shape. Note that doing so may seem scary as the skis will pick up speed in the fall line. When turning in a wedge, you have more weight or pressure on one ski than the other. One ski does the work of turning while the other rests as it slides on the snow. Rather than picking up that resting ski, it should be less weighted or pressured than the working ski. The same is true in a parallel turn. One ski will be pressured more while the other is taking a rest. To move from the wedge to parallel, practice shifting onto that new working ski sooner in the turn. Which ski is doing the work and which is resting? 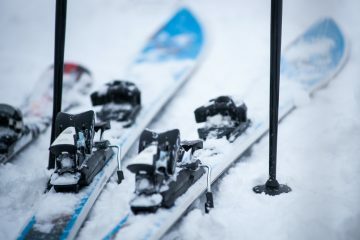 In both wedge and parallel turns, the turn starts by pressuring the shin sweet spot against the boot on the working ski. Due to the arc shape of the skis, pushing on the working ski turns the skis downhill and through the turn. Let this working ski be the boss. Let’s look at the other ski, the resting ski. The difference between the wedge and parallel turns is the resting ski’s job as the assistant. In the wedge turn, it stays in a “V” position. In the parallel turn, it slides through the turn parallel to the other ski. Parallel turns require a bit more time in the scary-facing-straight-downhill position. However, putting a bit of pressure on the little toe side of the boot will help you steer the resting ski in a parallel position. At the turn’s finish, the skis swap jobs. The resting ski will become the new working ski or boss for the next turn as the working ski becomes the new resting ski or assistant. When making parallel turns, fear lurks in the fall line. As soon as the skis turn into the fall line and point downhill, they pick up speed. To prevent sailing out of control straight downhill, focus on the turn shape. Make rounded “S” shaped turns rather than sharp angled “Z” shaped turns. Making “S” turns requires gradually pressing your shin against the boot of the working ski rather than throwing your body weight sharply onto the ski. Pressuring the working ski should be in three steps with each step upping the pressure. At the beginning of the turn, a little pressure can initiate the turn into the fall line. From there, increase the pressure to medium on the big toe edge of the working ski to cause the ski to continue to turn across the slope. To finish the turn, apply heavier pressure. When skiers become more confident with parallel turns in the fall line, they can play with speed. Shortening the width of the “S” will let the skis run faster, while more pressured turning slows them down. Linking parallel turns involves swapping the ski jobs at the end of the turn. As the turn finishes, the working ski is the lower ski and the resting ski is the upper ski. To link to the next turn, the working ski or boss becomes the assistant. The resting ski or assistant must now step into action as the new working ski or boss. 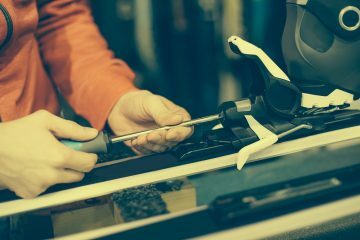 Focusing inside your boots, reduce the pressure on the old working ski and gradually increase pressure on the sweet spot of the new working ski. The swap continues on each turn. As you work to go from wedge turns to parallel turns, move the transfer onto the new ski sooner up in the turn. The sooner in the turn you can move onto that working ski, the more your turns will be parallel and controlled. With the ultimate goal of carving parallel turns, test driving the edges of your skis can help you feel how they work. On a flat surface, stand with your skis parallel at hip width apart and body weight balanced in your boots. To experiment with edges, push your shins into your boots slightly on the left side and then right side. You should feel the edges of your skis bite into the snow rather than the flat bottoms sliding. You should also feel the big toe of one foot and the little toe of the other pushing down on the boots. Then, move the experiment to a gentle slope. When learning to carve a parallel turn, focus on pressuring the big toe on the working ski and using less pressure on the little toe of the resting ski. As you cross the slope with skis parallel, push the big toe of your working ski. If you push harder on that toe, your skis will turn uphill or even stop. Reverse your direction on the slope to test the other edges. Then, try out full turns and concentrate on pressuring the big toe of the working ski and pressing less on the little toe of the resting ski. After each turn finishes, swap the ski jobs and focus on the opposite toes. 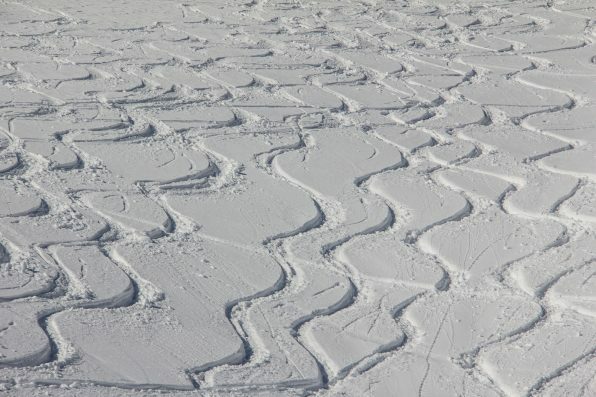 Carving parallel turns simply requires moving between the big toe and little toe edges of the skis. In short, the skis start the turn on edges, flatten briefly in the middle on the fall line and finish the turn by going onto the opposite edges. When parallel skiers swap which ski is pressured at the end of each turn, the action happens at the same time with both feet. The skis roll together to the new edges and the newly pressured working ski. Part of the edge change happens when “standing up,” which flattens the skis. 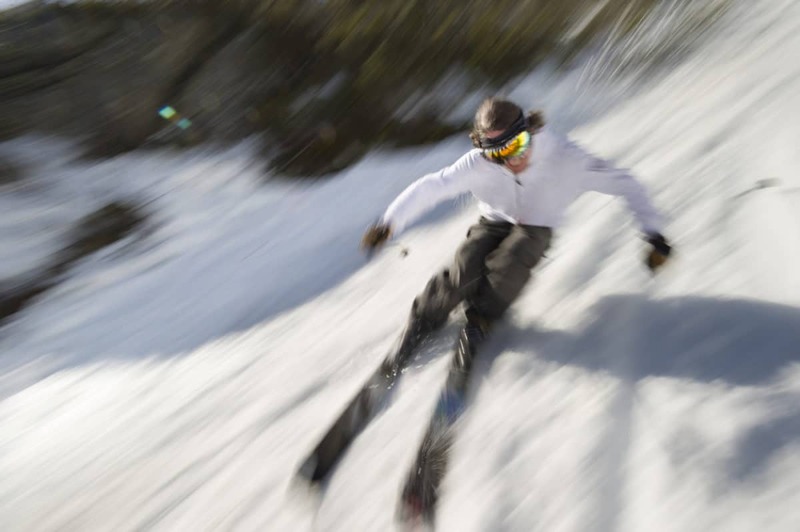 Since the primary flex happens in the ankles, pushing off both skis involves standing up to transfer to the new working ski to initiate the next turn. Where’s your focus in all these? In your boots and on your working ski. When linking turns, transfer your focus back and forth to the working ski. As you transfer to the new working ski at the start of a new turn, shift your focus to the new big toe edge and new working boot. It all happens at the same time. To perfect parallel turns, take lessons from a pro. Some ski schools use a direct-to-parallel method of instruction that bypasses the snowplow or wedge turn. Traditional instruction builds parallel turns from wedge turns. In North America, look for ski instructors certified through the Professional Ski Instructors of America (PSIA) or the Canadian Ski Instructors’ Alliance (CSIA).